After 1066 England can be considered part of a greater French empire. The French influence on the English language was very strong for many years after 1066. There are many English words of French origin and, of course, French words continue to be imported into English today. 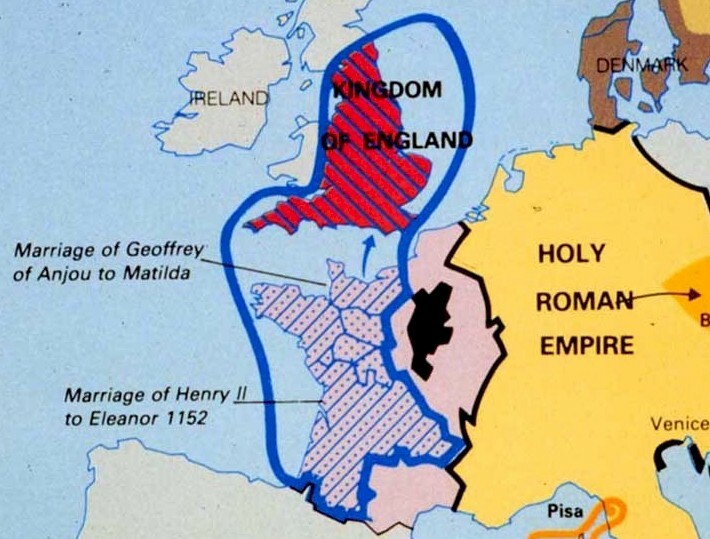 After 1066, the French-speaking and French-thinking rulers of England were very concerned with keeping land in France, which was much richer than England. For example, Richard the Lionheart has become an English hero but he spent most of his time in France, spoke French, and wasted enormous amounts of money fighting expensive wars, particularly in the Middle East where he was guilty of incredible acts of cruelty and injustice. Richard used the English as a source of tax revenue and wasted it on Crusades and other military adventures. As second class citizens, or lower, the poor English were to be exploited as much as possible. The Anglo Saxons were at the bottom of society. The people right at the bottom were no more than slaves. People with power thought that only French things were important. In fact, the king at the top was always French! He was the boss of the English kings. The Domesday Book was just the start of a Norman French policy of taxing the English to finance wars abroad. Even rich powerful people eventually got sick of the irresponsible, stupid behavior of the kings of England, which wasted money and people’s lives. In 1215, the wealthy Barons of King John rebelled and forced him to sign an agreement that limited the power of the king and protected their own rights. 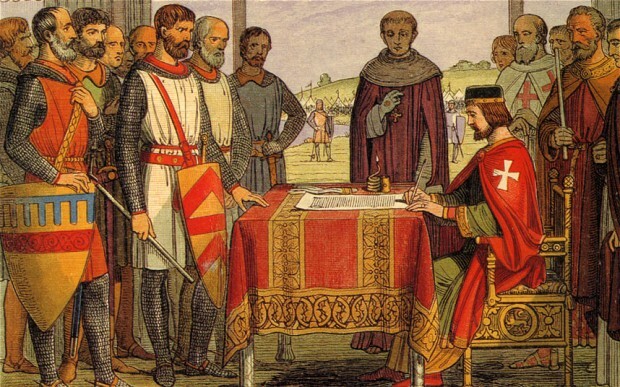 King John signing the Magna Carta 1215. The Barons are saying, “Other people have rights, too. Not just you.” This was the start of a big idea. In British folk culture, the image of Robin Hood fits into this scheme. English kings were greedy and focused on squeezing more and more money out of the poor Anglo-Saxons in order to fight wars and get more land in France and elsewhere. Tyrannical kings made slaves out of the good people of England. The myth of Robin Hood: France-obsessed English Kings squeezing more and more tax money out of desperately poor Anglo-Saxon citizens. 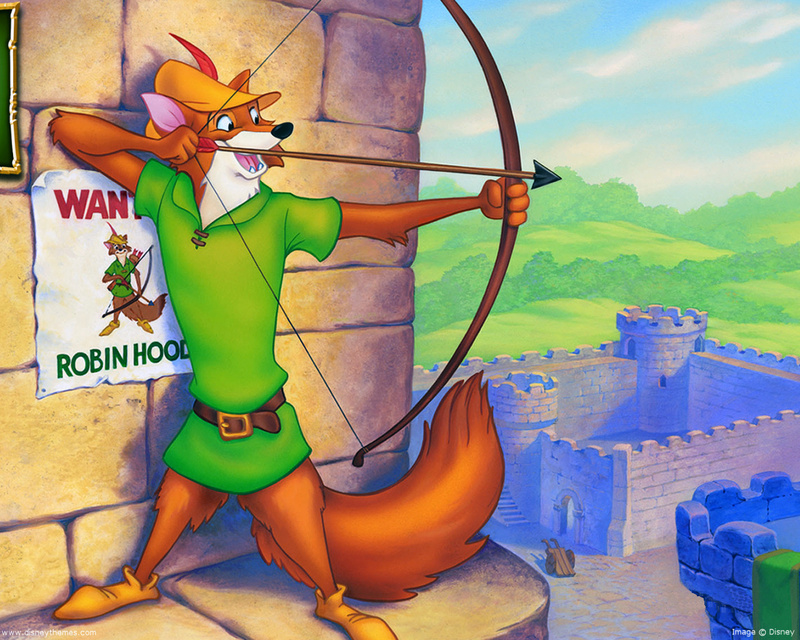 Robin Hood must become an outlaw, live in the forest, and steal from the rich to give to the poor. Life must have been unbelievably hard for ordinary people and it was made worse by regular outbreaks of disease. The Black Death of 1348-50, for example, killed millions across Europe. England, along with the rest of Europe, was hit very hard. The Black Death (1348-50) killed as many as 200 million people in Europe. 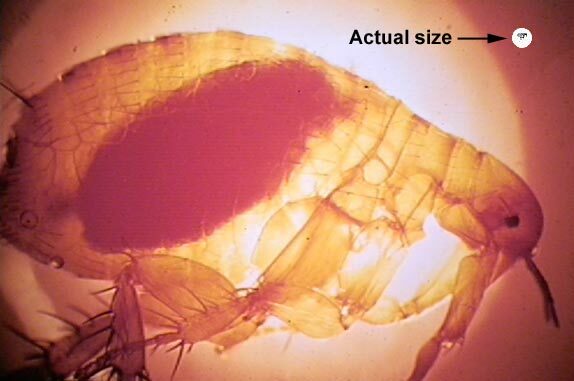 It may have been spread by fleas like this. The British Isles were very hard hit. 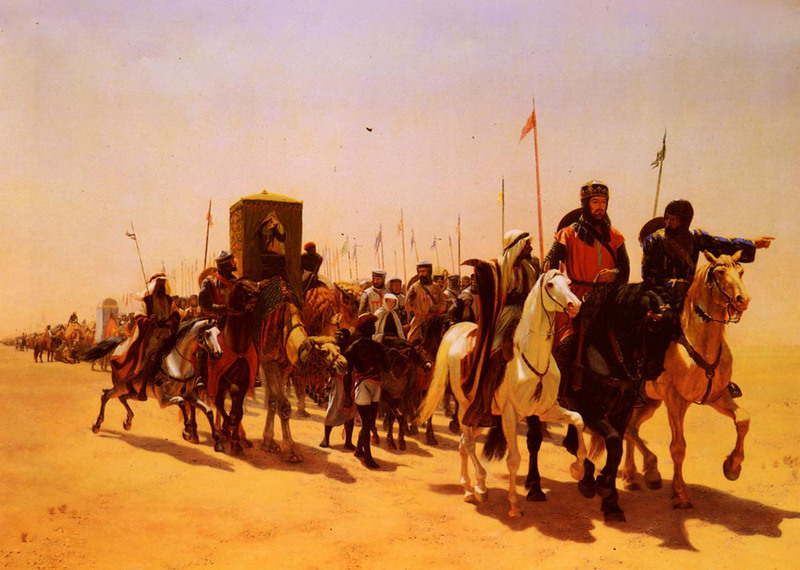 It is likely that as much as 45% of the population had been killed by 1350. The plague came back another three times by 1375. However, because the supply of workers dropped when so many people died, ordinary workers suddenly found they had more bargaining power. 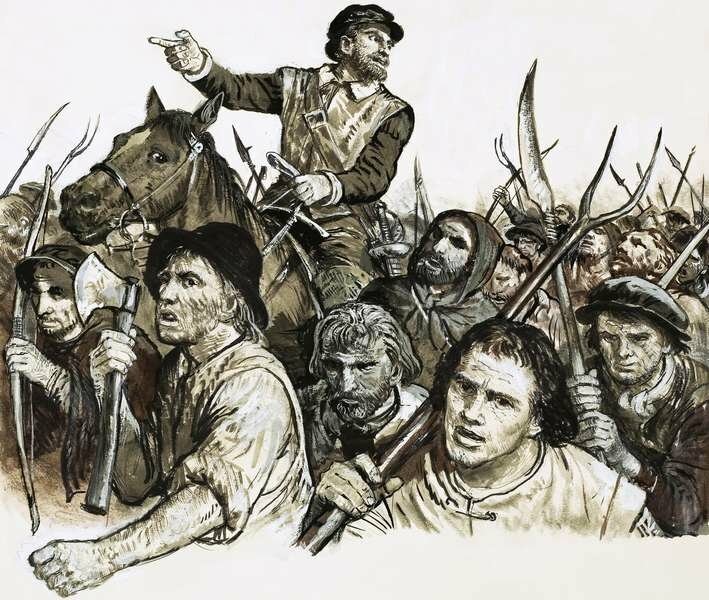 Common people became a little richer and more confident; this led to the Peasants’ Revolt. People could not endure much more. Also, the supply of workers had dropped so working people wanted to take advantage of better bargaining power; working people wanted rights, too. In 1381, there was a big rebellion in England led by a man called Wat Tyler. This was the astonishing Peasants’ Revolt: the historical reality buried under the Robin Hood myth. The rebels wanted a reduction in tax and proper payment for workers. The Peasants’ Revolt of 1381. People wanted lower taxes and proper pay. People were fighting for their rights and were not prepared to be treated as slaves any more. Most of the rebel leaders of the Peasants’ Revolt were captured and killed but ordinary people were starting to fight back and it came as a huge shock to the ruling classes. Ordinary English-speaking people became an unstoppable force. 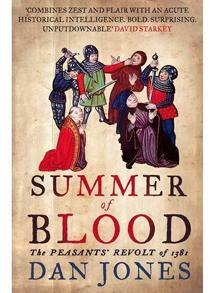 The common people of southern England controlled large areas of the country for days on end in the summer of 1381. It was an astonishing, well-organized military operation led by a talented General, Wat Tyler. It showed that common people could use their low-status language to plan and threaten the establishment. The English language, the language of ordinary people, was also becoming an unstoppable force. French and Latin remained the languages of prestige, power, and education for many years but the English spoken by ordinary people was becoming more important and very fashionable. English began to emerge as a fashionable language of literature in the fourteenth century, around the same time as the Peasants’ Revolt. Poets like Chaucer, Langland, and the Pearl Poet started to experiment with the ordinary language of English people instead of Norman French or Latin. After all, it was more natural and more fun to write about unique English characters in the English language rather than the language of educated people. 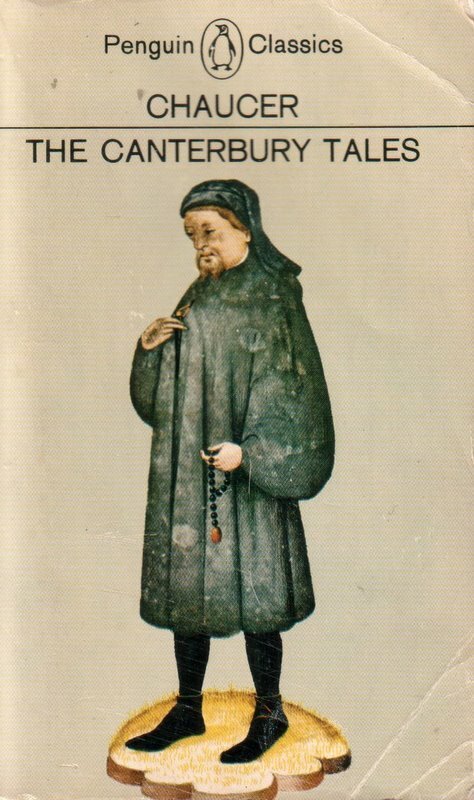 Chaucer’s great work describes many unique English characters. It was more natural to write about these in the English of ordinary people than in Norman French or Latin. Also, the legend of King Arthur had become extremely popular in France from the twelfth century. These tales, which remain just as popular today, are about a great but humble and honest British leader. 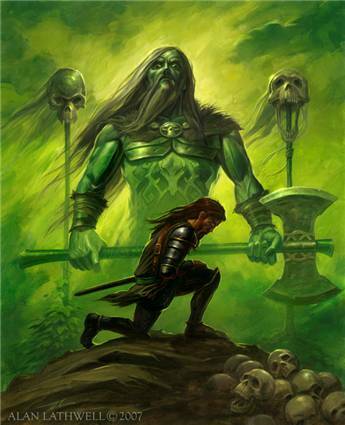 They originated in the mythology (some say reality!) of the fifth and sixth century Brittonic Celts so it was completely natural to tell these stories in the language of the ordinary people of the British Isles. The legends of King Arthur became hugely popular in France and spread to England but they actually originated in Celtic Britain. Arthur was a British leader, so why should he speak French or Latin? It was quite natural to want to develop these stories in the language of ordinary people of the British Isles. As the printing press had not been invented, the development of English as a language of literature was still relatively slow. However, by the beginning of the fifteenth century everyone was speaking English, even the king. French was starting to disappear from England.